Yet this was not always so. Prior to the Fall, the god Slaneesh was little more than a wayward element within the Warp; a Lesser God whose power could never hope to match his rivals. There are, in fact, countless "gods" within the Warp. These can range in power from creatures such as Slaneesh, who are on the verge of challenging the Dark Prince&#39;s position within the Great Powers, to creatures with power comparable to a Greater Daemon, or Daemon Prince. D&#39;rath personifies mankind&#39;s desire for all things. He embodies the kleptomaniac lusting that consumes all men, the avatar of the insatiable need for more. D&#39;rath&#39;s realm is a floating castle within the Warp. Inside it, trinkets rise up from the floor, stacked high from across time and space. Upon his walls hang all manner of decorations, from priceless artworks to child&#39;s scrawlings, from opulent banners to flayed corpses. His towering mounds of wealth contain all manner of lustful items; money, weapons, gemstones, pieces of art, books of ancient lore and almost anything a man may conceivably long for. All of these things lie neglected, for D&#39;rath and his followers lose interest the moment their prize is acquired; he is forever longing, forever lusting, ever searching for some material object that will somehow grant his existence ultimate purpose. Men are not drawn to worship D&#39;rath as such, rather they are slowly turned toward him due to their own internal thirst. D&#39;rath does not offer salvation to his followers and their material lustings, he embodies it. Their souls become bound to him, doomed to spend the rest of their mortal and immortal lives hunting, taking, stealing and killing to obtain the unobtainable; contentment. Ashtva is strongly opposed to Khorne; he despises the Blood God&#39;s loud, brutish way. He is also disdainful of Slaneesh, whose lustful ways are utterly alien to his quiet, patient malevolence. There are few followers of Ivaltn, and this is perhaps just as well; their mind-numbing refusal to face reality can tax even Tzeench&#39;s patience. Ivaltn is opposed to anyone and everyone who does not see the world his way - which means, as he refuses to accept anyone&#39;s outlook, that he is utterly alone in the Warp. Top Left: A Follower of D&#39;rath. 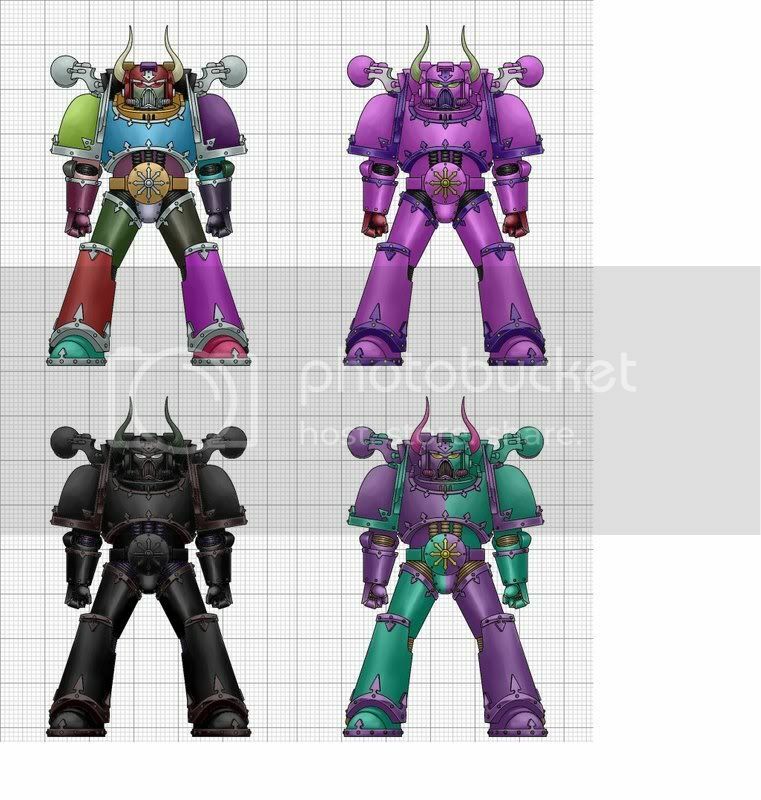 Driven to pursue all things, D&#39;rathian warriors, like his Daemons, bedeck themselves in multicoloured armour, never able to choose a pattern or style that is satisfactory. The depicted warrior was part of a three-hundred strong warband that stole half a dozen Land Raiders from Abaddon&#39;s warfleet prior to the launch of the Black Crusade. Top Right: Tu&#39;zanno the Skullbreaker: self-proclaimed Prophet of Nulcrali. A cunning and deadly warrior, his hands are forever stained with the blood of allies he has flippantly disposed of on his long and bloody campaigns. Last sighted leading a Corsair band into the Ork Empire of Gulcrakk Deffkilla. Bottom Left: A Deathwalker of Ashtva. Servants of the Shadow-God Typically wear all-black armour, so only their unholy eyes can be seen. The dark reds, blues and greens denote the warrior as a member of the Gallowmen, a Warband believed responsible for the disappearance of the Tau Custodian-class Starship Vior&#39;la Kaius J&#39;kaara, and have brought an entire Sub-sector to its knees; a region known as "Beyond" from which no living soul ever emerges. Another excellent article worthy of some Karma and eternal glory in the Important Topics Sticky. +1 Karma - Anton. Wow, well done. Definitely an cool idea. I like D&#39;rath a lot, I&#39;ve always loved that sort of insatiable greed/obsession with shiny things aspect. Now it comes in Chaos Space Marine. It&#39;s not canon. But why should that matter? Potentially every single negativity can have a God for it, even if the Big Four also represent it in some way. There could be a God dedicated to Pain which is really just a facet of Slaanesh&#39;s larger whole. They&#39;re Gods. They can do anything. Also, with the CSM list not having God-specific Daemons... it makes you think "well, why not?"